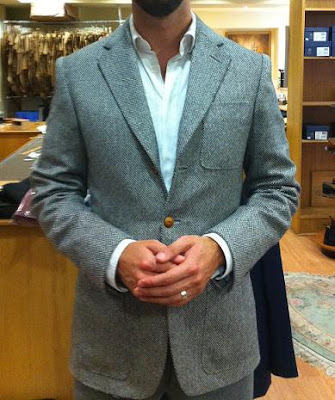 I got my cashmere blazer from Graham Browne this week, commissioned a couple of months ago following the plan more more soft, unlined jackets (post here). The cloth is from W Bill, cashmere and in a rather chunky, open weave that makes it even softer to wear. 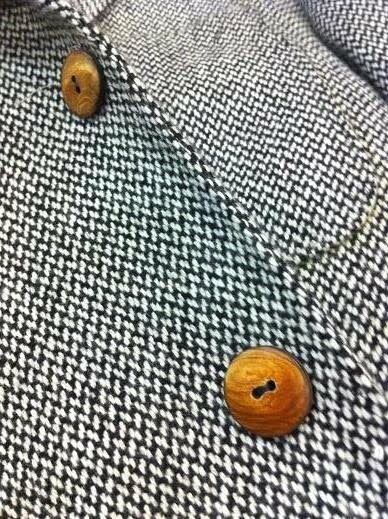 The buttons are wooden, from haberdashers MacCulloch & Wallis just off Bond Street. Three button, it features patch breast and hip pockets, each with their own welt. There is also a collar tab that fastens across the neck and a button under the lapel to button there. I also went for a half lining, to enhance that sweater-like design. 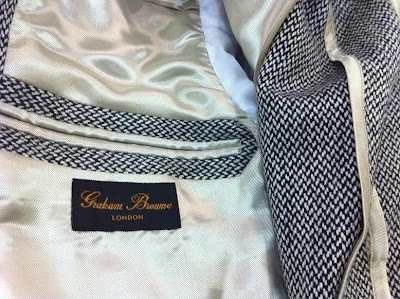 You can follow the discussion on Graham Browne, W Bill cashmere blazer by entering your email address in the box below. You will then receive an email every time a new comment is added. These will also contain a link to a page where you can stop the alerts, and remove all of your related data from the site. The blazer looks very good, and perfect fit. But the photo only shows your upper body, not sure what it looks in full. Anonymous – if you ask your tailor for W Bill bunches, or indeed show him this post, I’m sure he will be able to find you the cloth. Can’t remember what the bunch is called I’m afraid. Jimmy – not sure what you mean. It’s not a suit so there’s nothing to show on the lower body? 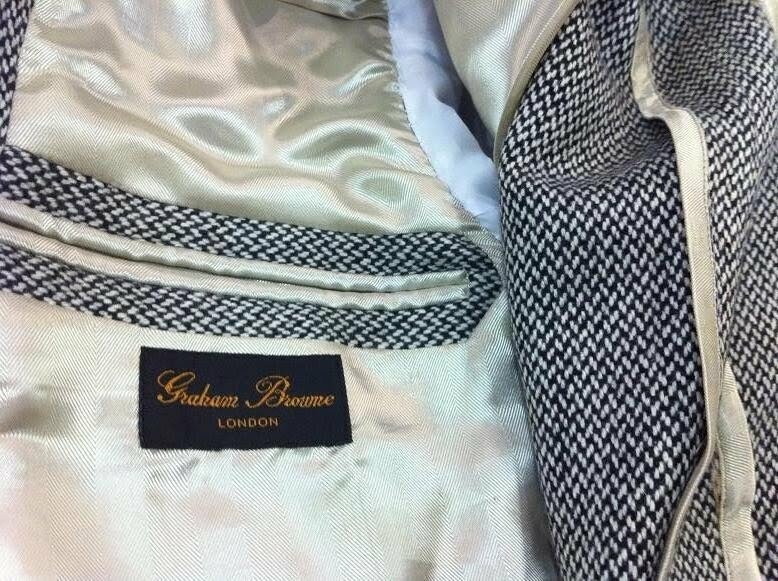 Do you need an appointment to be measured at Graham Browne, or can one just pop in? Also, am I right in recalling that suits start at around £ 800? No, just pop in any time. You may have to wait a little longer if you don’t make an appointment, but fine to drop by. Suits start at £850. As I have written about before, the make is a way off Savile Row, but that’s half the reason it’s not £3000. And I think fit is far more important. You won’t find a bespoke-cut suit for cheaper in London. Sharp, I really like that. Stellar looking jacket. Not sure about the wooden buttons though. Great cut, and I like the buttons, they work well with the grey. Don’t Graham Browne do a sale around this time of the year? I love this fabric. What is this particular weave called? (Looks like a diagonal basketweave. You’re probably going to hate this, but I think jacket will improve with age as it looses some of its (rigid) shape, and becomes more fluid and draped. Hi Tom – there was an offer on casual trousers over the summer, but no sale on suits. Hi Simon really like this, would you mind sharing the price to make? Do you still wear this jacket? How has your view on this jacket evolved over the years?